Love and Constancy Rewarded, George Morland, 1785, British Museum. 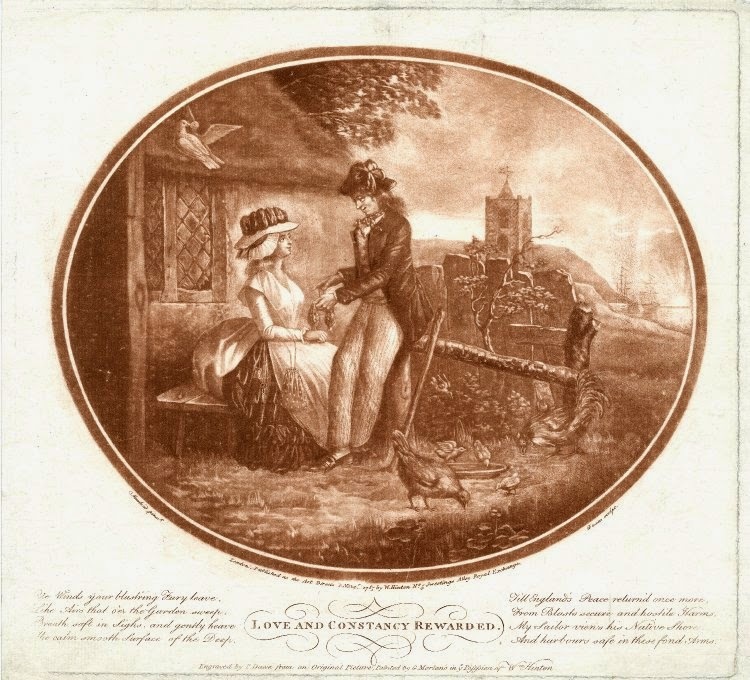 Perhaps retreading the cliche of "The Sailor's Return," Morland's piece (as engraved by Philip Dawe) depicts a sailor sharing a peaceful moment with a beautiful young lady. In his hand he holds a miser's purse, and resting beside him is a walking stick. His jacket is somewhat longer than is typical of this late a period, but certainly not unheard of. The slash cuffs are buttoned shut, perhaps with brass buttons, though it is difficult to be certain. Our tar's neckcloth is dotted, and tucked into his waistcoat. Striped trousers complete his garb. The title of this piece is interesting. I take it to be a call to sailors to mediate their notoriously loose morals when away from home. One wonders how effective such a call would truly be to the men who spent so long aboard ship and on foreign shores!